Humor Department... or "Smile, It's Only a Hobby!" Humor has long been a vent for frustrations in life. As the old saying goes, "You gotta learn to laugh at yourself. Life is a joke and you're the punchline." 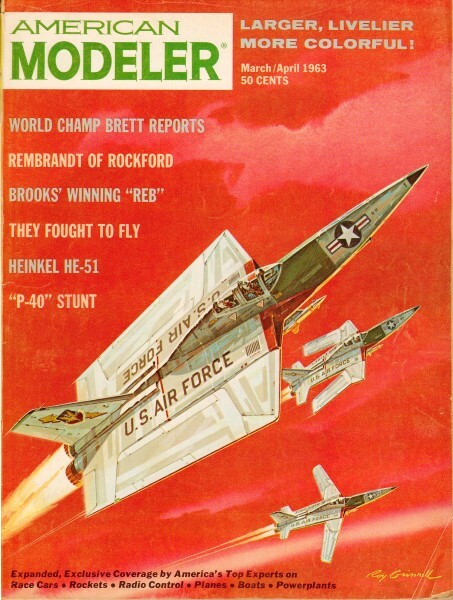 Here are a few model airplane related comics from artist Roland that appeared in the March/April 1963 edition of American Modeler. Enjoy. "I don't care if the Philmont 'Hams' are tracking every model ... for once I'm making sure I know where this blankety-blank free flight comes down!" "Step right in, Mrs. Umlaut, Herbert will be delighted to tell you of his hobby in his own quiet way ..."